This list covers almost all Google services and tools. StreamDrag is a free music search engine that uses YouTube database to pull our songs for user’s playlist. We can find here any music video that’s on YouTube and just enjoy our music without the video. Functions are regular, like for the playlist you have the ‘+’ icon, and rest is as usual. The StreamDrag developer, David Lorenz, claims that the simplicity of this application is the key difference here, as well as some features that enhance the user experience such as looping a single track. 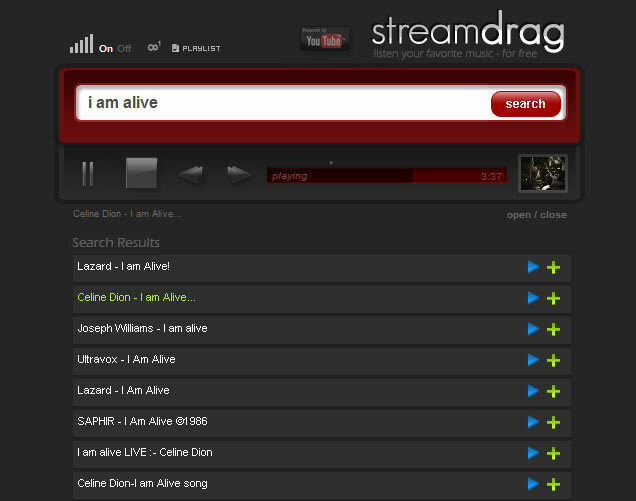 StreamDrag is a competitor to music search engines like Songza, SeeqPod.com, MySpace Music etc.